Our approach is to provide a full service solution for our clients. Our core strategy is not to sell individual investment products, but to build a long-term relationship where we can guide and act on behalf of each client within the many different aspects of wealth management. We act as the independent advisor on investments in financial markets, real estate and funding but also on long term strategies related to wealth and inheritance planning. A client relationship is always based on continuous and thorough analysis of the specific needs and risk preferences of the client. We incorporate an extensive array of information including other assets not applicable to be part of the investment portfolio - e.g. illiquid assets, family businesses and personal properties. This gives the client and us a complete overview of all assets and risks. 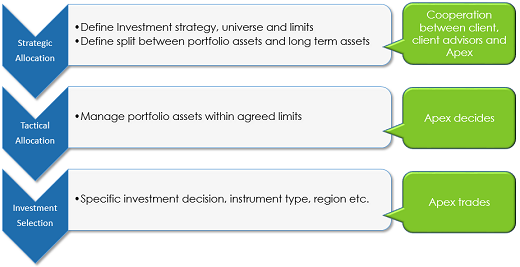 In most cases, we manage full discretionary investment portfolios on behalf of our clients.